â€œJapanese American Black Panther Party founding memberâ€ reads at first like a mislabel in the description of the 2009 documentary AOKI. Mike Cheng and Ben Wang chronicle Â the life of Richard Aoki (1938-2009) from his early years in a WWII internment camp through his days as an activist in Oakland. Shot over the last five years of Aokiâ€™s life, we follow him as he continues his career as a social activist in Oakland. Clocking in at ninety-four minutes the film is pretty much what you would expect. Straightforward framing and first person narration steers us through Aokiâ€™s life as an early activist. Aoki is a very charismatic, opinionated, and often blunt character whoâ€™s peers speak of him with the utmost respect.Â Although the film lacks much of an artistic direction (the film poster would have you think differently) I really enjoyed revisiting famous photographs of Huey Newton and Bobby SealeÂ but locating Aoki as a background character. 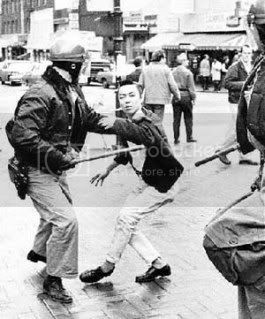 The documentation ofÂ his search for social justice involves him in not only the BPP but also the Asian American Political Alliance and the Third World Liberation Front. Politically, I would be labeled a conservative at the time, because of the fact that I voted for Richard Nixon in the 1960 presidential election, when he ran against John F Kennedy. Now I will explain the logic of my political position to you as weird as it may sound today. First and foremost, Richard Nixon was from California. Kennedy was from Massachusetts. Richard Nixon was a homeboy. Kennedy spoke with a foreign Boston accent. Richard Nixon married a good housewife. Kennedy married some arrant socialite later to be known as Jackie O. Richard Nixon grew up poor and humble. Kennedy grew up rich. I think his father’s or his family’s fortune was based on the rum running trade during the prohibition days when alcohol was outlawed here in the United States. I think rumor has it that his family built their fortune up smuggling (laughs) hard liquor across the border. Richard Nixon was a Quaker. The Quakers were the only religious group that, or were one of the few that opposed the internment of the Japanese Americans during World War II. Kennedy was a Roosevelt man, and Roosevelt signed Executive Order 9066 that put us Japs in the camps. So, it’s payback timeâ€¦ Meanwhile, one of the other reasons why I voted Republican was the fact that Abraham Lincoln, who was the first presidential candidate of the Republican Party, freed the slaves. And to me and my sensitivity to African Americans, indicated that I should be in favor of somebody that emancipated the slaves. For the entire article please check out the Richard Masato Aoki Memorial page.